Thirteen people died in this tornado in Charles City in 1968. 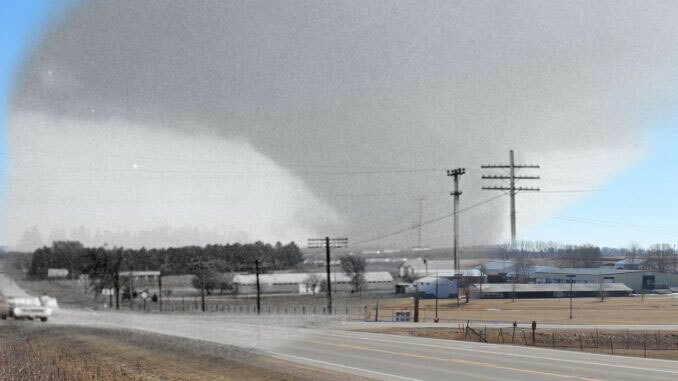 Today marks the 50th anniversary of the state’s deadliest tornado outbreak. Two F-5 twisters touched down in northeast Iowa on May 15th, 1968. The tornado that hit Charles City killed 13 people. Adam Nielson, with the Floyd County Historical Society, says they’ll host an observance late this afternoon ( 4pm) – at about the same time the tornado struck five decades ago. “We will be reading off the list of the names of the people who lost their lives in this tornado,” Nielson said. “We have asked a few of the churches if they would ring their bells 13 times for each of the lost.” Shortly after the observance, the Floyd County Historical Museum will unveil a new digital exhibit. While the Charles City tornado killed 13 people and injured 462 others, the second tornado killed five people in Fayette County and damaged or destroyed nearly 1,000 homes. The hardest hit towns were Oelwein and Maynard. The total damage from the two tornadoes was placed at more than $50 million.